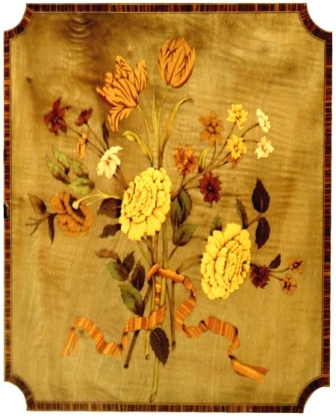 This tulipwood and marquetry cabinet was copied from a bibliotheque-basse produced by the eminent Parisienne ebeniste, Jean Francois Oeben around 1770. The client had watched the original be sold at auction for a sum far beyond the cost that he had in mind, and commissioned a copy. The piece is an authentic copy, including modelling of the ormolu mounts, the correct marble of the period and exquisite hand-cut marquetry. The only external change from the original is that the doors are hinged and not tambours. The interior of the cabinet is fitted out to carry drinks glasses; the top drawers are fitted out with a wide range of board games from backgammon to shove halfpenny, ivory dice, cards and accessories. The current cost, would be in the region of £12,000. Including the bespoke games equipment the cost would rise to £18,000.